"Laughter is wine for the soul---laugh soft, or loud and deep, tinged through with seriousness....Once we can laugh, we can live." S. O'Casey. A Cover Girl Dinner can be medicinal. As both sides of my family cope with what life throws at us - there is nothing better than spending time making light of what you can and sharing a meal. The March Bon Appetit issue was devoted to "comfort food." But it takes more than food to comfort - it also takes sharing the food with others. Comfort is taken to a new level. For a few hours, you can laugh at what pains you. You can share and lessen your load. Our appetizer, entree and dessert all came from the March Bon Appetit issue. Comfort ruled my home for an evening. Early March brought warmth to Minnesota. Late March brought icy winds and fear of flooding. We are in transition. Just as our families are. Just as our children are. Talk centered on our parents, graduations, new vistas for our increasingly grown-up children. So, grab a mug of coffee or tea, or pour a glass of wine. Take out a digestive biscuit and get comfortable as I go through the menu. The post is a long one - but fulfilling. Some Asiago cheese and Sicilian olives were put into the living room. 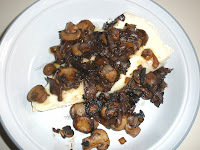 And just because the day required some warmth, we started with brie smothered with sauteed mushrooms. And baked till all was gooey, sloppy and impossibly comforting. I had to make some adjustments to the Shepherd's Pie - which traditionally calls for lamb. I eat lamb but am related to people who do not. And since part of cooking is sharing the meal with others, I did substitute beef. Of course the results are different but really - it was savory, mellow, tender - all components of being comforted. *Start this dish well-ahead of time; it's not hard but it takes time. Don't be put off by the number of ingredients - the overwhelming majority are things you probably have. Filling: Scatter eggplant on rimmed baking sheet. Cover with Kosher salt, toss and let sit for an hour. You can toss a few more times. Rinse and pat very dry. Heat 3T oil in large skillet over medium high heat. Add eggplant, saute till tender, about 12 minutes. Transfer to bowl. Sprinkle meat (lamb or beef) generously with coarse salt and butter. Toss with a sprinkling of flour. Add 1/2 to pan and cook till nicely brown (about 8 minutes). Remove, add 2 more T of oil and do 2nd half. Remove. If needed, add 1 more T of oil to pan and saute onions. Cook over medium-low heat till very tender - about ten minutes. Note: Bottom of pan will be well-browned. Add wine to pot and increase heat. Scrape up all brown bits and simmer till all wine is evaporated - about five minutes. Add tomatoes with their juices, broth, garlic and oregano and bring to a boil. Add lamb and any accumulated juices. Cover. Reduce heat to love and simmer for one hour. Take a shower and vacuum the house. Uncover skillet and continue to reduce until the sauce thickens slightly - about another 45 minutes. Do your nails, read a book, make the potato topping, bake a cake (which is what I did), turn on your favorite CD and sing loudly. Dance. Relax. Stir in eggplant. Season with salt and pepper and transfer to a 13 x 9 x 2 inch glass baking dish. Can be made ahead. Cool slightly, cover and refrigerate - or forge on. Preheat oven to 375 degrees F. Cook potatoes in large pot of salted boiling water till tender - about 14 minutes. Meanwhile, melt butter with oil in medium sauce pan. Add garlic, saute until fragrant (1 minute). Add milk and bring to a simmer. Drain potatoes and return to pot. Stir over low-medium heat till all liquid is evaporated. Add milk mixture and mash till smooth. Stir in cheese and season potatoes. Drop heaping tablespoonfuls of potatoes on meat mixture. Smooth till all is covered. Fold in oregano. Bake "pie" until all is heated through - and potatoes are golden - about 45 minutes. The photo is blurry, (when it's time to serve your guests - you serve your guests), I forgot the oregano but it was a flavor medley of vegetables, tender meat and soft-cheesy potatoes. As comforting as a warm blanket and wonderfully casual - nobody worries if the napkin falls off your lap, if the sauce oozes over the plate or if your elbows bump. 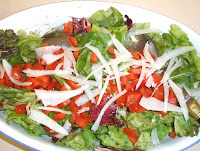 An impromptu salad of butter lettuce, red peppers and shaved Parmesan in a vinaigrette was served on the side. 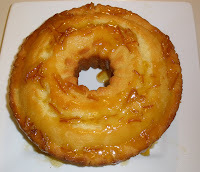 I served Dorie Greenspan's French Yogurt Cake with a marmalade glaze. Everyone had one piece of each. Sweet comfort. Enrichment: It's what I do when schools call me in as an artist-in-residence. 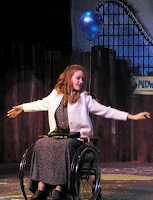 I bring in the spoken word, theatre and we - play. Enrichment is also what I do when I cook for my family. I bring them together to break bread and share their day. But I do work - and I cannot always be in the kitchen 24/7 concocting delectables for loved ones. And after a Saturday of non-stop cooking for my "Cover Girl Recipe dinner," simple was preferable. It was one of those days when you reach deep into your freezer of odds and ends and discover, "Uh oh. The homemade broth is gone." I have discovered ways to take a can of chicken broth and turn it into something more flavorful, deeper and yes - enriched. Once I have the broth to my liking, I can add whatever my heart desires to it. I like being able to tap into "my heart's desire" from time-to-time. Preheat the broiler. Trim the root end of the first onion but do not peel. Cut it into four slices. Arrange on a sheet of aluminum foil and put it under the broiler. Broil fifteen minutes until all is browned (turning once midway). Pour the broth into large stock pot, skimming off the hardened fat. Add the broiled onion and all the remaining ingredients. Bring to a boil, adjust heat to simmer, pud a lid on it and cook for 30 minutes. Remove the pot from heat and strain the stock. Use right away or allow it too cool and refrigerate or freeze. It's not homemade stock but it is pretty good. 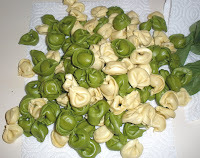 - some fresh tortellini (which I boil separately and leave separate for each to add their own - do not like soggy pasta!) 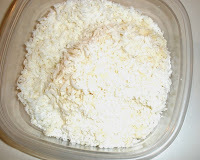 Had freshly grated Parmesan ready to go. Sauteed a few shiitake mushrooms. 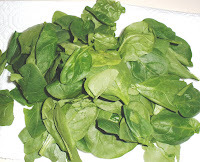 And had spinach trimmed and ready to be wilted. 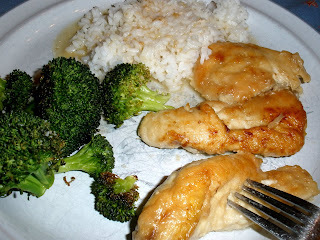 It's a good transition meal - not as heavy as winter comfort food and certainly not fish on the grill. 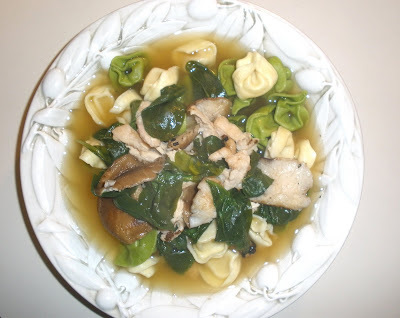 But the spinach invokes spring, the shiitakes look like awkward adolescent mushrooms - all gangly and fresh. And tortellini knows no seasons. I always keep some in my freezer and it always needs replenishing. There has been some spring comfort the last few days. The cold and ice has kept the Red River from hitting flood predictions. It lengthens the process - for the water still needs to flow and the snow and ice will melt. But it granted the upper Midwest a reprieve. More time to shore up their homes. More time for the river to move past the towns. Spring comfort comes in all sorts of ways: the chattering robins, seedlings with promise and a soup - hearty enough for an icy spring but light and easy enough to throw off the mantle of winter cooking. I wish I had leftovers. We are all waiting. For the Red River to crest. First it was supposed to happen Friday night. Now, it's Saturday afternoon. The Red River Valley flooded in 1997. Coming from NYC, I had never seen anything like that. Of course, I was also new to the ways of tornadoes and what "wind chill" really means. I paid no attention to weather in New York City. Sure, there were days I should have worn gloves, but in general, I never felt as if my life was in danger from weather. It's different in Minnesota and these days - it's different in North Dakota. My son went to Fargo on Tuesday to help sandbag. (You know - it's amazingly low-tech and it works.) They were figuring on the river cresting at 41 feet. Then the blizzard came. And now it may crest at 43 feet. Having just survived my son's road trip (and mishaps) roundtrip from central Minnesota to San Diego, I was not prepared for another day of worry. But that blasted blizzard blew into the Dakotas. And my son was in the middle of it. So, I went back to baking. 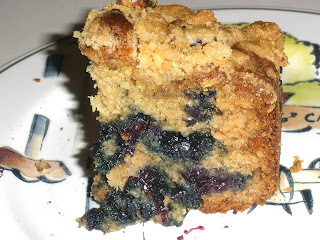 It was Tuesday and I had decided to follow Tuesdays with Dorie and made her Blueberry Crumb Cake. Not hard and it took my mind off of things. I awaited news on Facebook. Yes. That's how parents get a lot of their kid's news these days. Luckily, my son is "my friend!" Heat butter and oil in a large skillet. 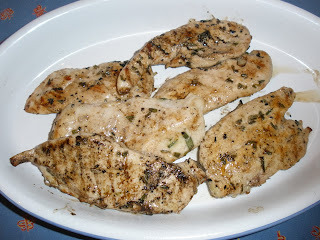 Dredge chicken breasts in flour. When oil and butter are merged and beautifully hot, drop the chicken in the skillet and let it brown. Turn over when browned nicely. Remove chicken briefly and dot that tenting stuff. Deglaze with chicken broth and/or wine or a little of both. Sprinkle lemon juice into the mixture. Return chicken to pot. Cover and simmer till chicken is done and all the flavors meld. (About fifteen minutes). I am a convert to brown rice but I really prefer white rice with this one. And as suggested by UnconfidentialCook, I roasted some oil-brushed broccoli in a 400 degree oven till just cooked and served it all. "Well the situation got a lot worse since we got back. The river is supposed to crest at 43 feet now, and not 41 feet like the dikes were built for. We helped build a dike in Moorhead first (at one of our classmate's house) and the dike is 8 feet tall there. We spent almost 3 hours Wednesday morning (1:30am-4am) in the Fargodome making sandbags, and then Wednesday afternoon was the coldest...We were in a Fargo neighborhood that day. The cold wasn't too bad overall, because we were moving so much.The house we stayed at is really in danger of being flooded...It's in the Rose Creek neighborhood and the dike is only a few blocks from their house. My friend Laura, who drove us there and is from Fargo, said some of her friends have already lost their houses and her grandmother had to be evacuated from her nursing home." It's real, surreal, not real. So, I continue to wait. Warm my home with cooking. Grateful for my kitchen. Do you always put food in your plays? A director posed that question to me as he was trying to understand what a "zeppole" was. As if rehearsed, my cast of ten answered as one: "Yes! She does." I never realized that. It makes sense - characters eat and you write what you know, but I have lately realized that my students are well-versed in how to make food props because of all the dining I have included over the years. In Ciao Cinderella, I have one long scene devoted to the history of Dove Bread. And another long scene devoted to the proper way to make ragu. The Academy of Cooking in Bologna decreed that there should be no nutmeg. Other cooks disagreed. Arguments still continue. And in Ciao, that ingredient is hotly debated. My recipe includes nutmeg. My students looked up the various recipes on the web. One enterprising student made it. 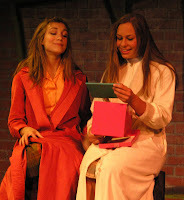 are discussed in By Candlelight - a tale of youth coming together after 9/11. Even in dramatizing the aftermaths of a terrorist attack, I was able to lighten some of the intense scenes with food. The lack of food is discussed and is the catalyst for what happens in The Hanging of the Greens - a holiday play. Meet Me at the Fair is a tale of holding on to your dreams - but the characters constantly move on and off stage with corn dogs and cotton candy. Fourteen loaves of bread were "built" for Commedia Delight. In Cockamamie Tales from Chelm, whole scenes are devoted to the discussion gefilte fish, challah and kugel. 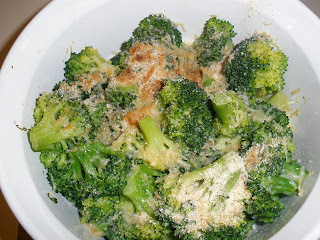 Heat olive oil in medium-large skillet (enough to hold in a single layer all the broccoli you are cooking). Add broccoli. (I added 1 lb.) Saute still just softening. Add bread crumbs (I added about 1/2 cup - a wee bit too much). Toss till bread crumbs are nicely browned. Season. Put on platter. Top with Parmesan and serve. I served it with leftovers. It all went. Maybe I'll but broccoli in my play. As long as I am teaching my young actors to cook, I must as well make sure they appreciate their vegetables. And in a return to sweets: I baked my second Tuesdays with Dorie's recipe of the week: Blueberry Crumb Cake. The results are at: Cover Girls Cooking. I never thought of ymself as a baker but I am slowly (with TWD help) changing that perception! My copies of the "Best of Paris," "The Best of Italy,' "The Best of the Mediterranean" etc. are dog-eared and well-used. I could justify my splurge on a dinner by noting that it is a lot cheaper than travelling abroad for some of these meals. And to save even more money (in the olden days), I became the "Queen of Chicken." It worked nicely with my other title as "Queen of No Money." One day when "life" did its funny detours and the planned dinner was not going to happen, I par-boiled some chicken, boiled some pasta, threw in some peas and then mixed it all together with a bit of butter and olive oil and then smothered it with Parmesan cheese. It was a hit. It became one of my children's favorite meals - enough so that it would be requested as their birthday dinner! 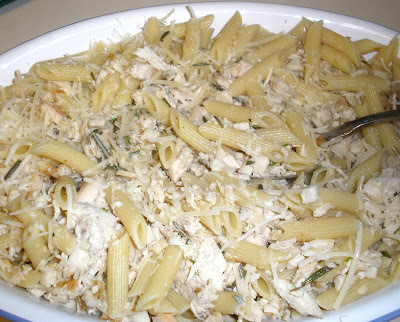 So it was no surprise that when I had the April 2009 Tastes of Italia open to their recipe of Penne with Chicken and Rosemary, my daughter changed dinner plans to eat at home. And their recipe is even easier than mine. You don't need to cook the chicken! Just bring home a rotisserie one. However, if you do cook your own chicken, rest assured no one will report you. 1/2 pound penne pasta, cooked according to package directions (why do we always say that - will we throw it in raw?) I always cook the full pound of pasta as is my custom - but I didn't need it. salt and ground pepper to taste. Cook pasta. In a large skillet, heat olive oil and combine chicken, rosemary and garlic. Cook on medium for 5-6 minutes. When pasta is done, reserve 1/4 cup of pasta water and add to chicken. Add pasta, cheese, salt and pepper. Toss quickly to mix and serve. It's that easy and so very good. You will be treated as a Queen. Until it's time to do the dishes. 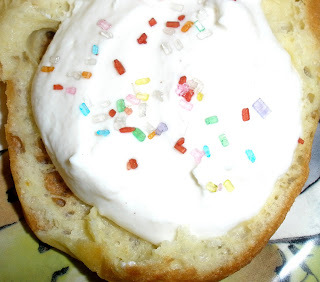 And for fun - something that I came across at Noble Pig, I discovered Cream Puffs in Venice Magazine Mondays. For someone who has religiously cooked from magazines for decades, I think I will join them and submit today's meal. Grandma's room on 166th Street in Jamaica, Queens was a wonderful mystery to me. Her dresser was a never-ending source of playthings. It was scattered with small statues of the Virgin Mary, pictures of saints as well as photos of her family that she had outlived. With my early actressy-aspirations, I would set all the statues and photos on the floor and set up scenes and move the saints around in my fantastical world. I would assign them characters and create dialogue in a multitude of voices as I went along. I am not sure Grandma would approve of me assigning the role of Dorothy from The Wizard of Oz to the Virgin Mary. I was Catholic enough to know I should never assign the Blessed Mother the role of the Wicked Witch. But Grandma never complained that her statues and photos seemed to be rearranged after I visited. And I continued to imagine away my time in her home. I remember early mentions of St. Joseph's Day - from my Catechism class and through Grandma, but it wasn't something we ever celebrated. I have grown more Italian with age. I realize that my specific childhood as an Italian-American in Queens, NYC is becoming extinct. My reaching out to my heritage is a way of laying groundwork for my children. I want them to know that America wasn't always chain stores and strip malls. I want them to be able to create a meal that was eaten generations ago and thus become acquainted with their past. And so, I went to the grocer today knowing there would be pasta. And Aunt Fay's stuffed mushrooms. I pondered the fritters but didn't want to deep fry anything, so went with the St. Joseph Day zeppoles that are baked. I had a recipe that didn't always state amounts and ended with: "put dollops of the batter on a greased baking sheet and bake." Hmmm....is a dollop a heaping spoonful? 1/4 of a cup? More? I reached back remembering the zeppoles I had at the old St. Gennaro Festivals in Little Italy and decided to go with about 1/3 of a cup. My remembrances of the St. Gennaro Festival is truly from the olden days - they didn't hawk socks and purses then - you had zeppoles and sausage and peppers, there was a parade, Italian was spoken on the street... I always had a zeppole - a huge deep fried mass of flour that was put on a napkin that did not soak up the grease and covered with powdered sugar. By the time I went to the sausage and pepper stand I was a spotted spaniel with sugar firmly sprinkled in my hair and clothes. After eating the sausage and peppers, the grease from the sauages combined nicely with the sugar. I was a walking tasty treat. Also - they were huge. But they were easy, are very tasty and you can fill them with cream, sweet cheese filling (such as for cannolis) or pudding. (cannoli cream in my case) it can be very, very filling. 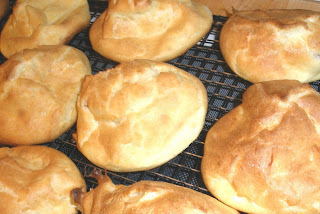 Using a pastry bag, you can fill the zeppoles. Or you can be a lazy bum as I was and simply cut them in half and put a "dollop" of cream in the middle, cover the zeppole and be done. Grandma may not have loved me directing the Virgin Mary in various plays but she would have approved of the zeppoles and my bringing St. Joseph's Day to my home in Minnesota. It's been in the 60's. THE 60'S! After twenty degrees below normal all winter, we are now twenty degrees above. I'll take it. The grill was lit when we hit 40. I almost feel like I live back in New York - where the crocuses and daffodils are up, the forsythia is budding and tulips have nudged themselves above ground. There will be no budding for awhile but spring eating will shake me out of of my windchill mentality. And just because Giuliano Hazan's book How to Cook Italian was still sitting on my cabinet from my "salmon-daze," I leafed through it. And voila! 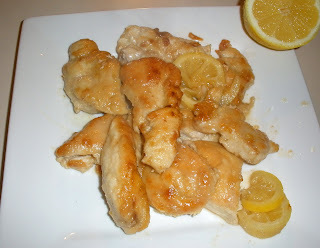 Marinated lemon chicken - on the grill! Cut the chicken into pieces or use what you have. I am an adapter - of both plays and recipes. Mix smashed garlic (I minced it, it doesn't need to be - I just like it when little pieces stick to the chicken when grilling), rosemary, lemon juice and olive oil. 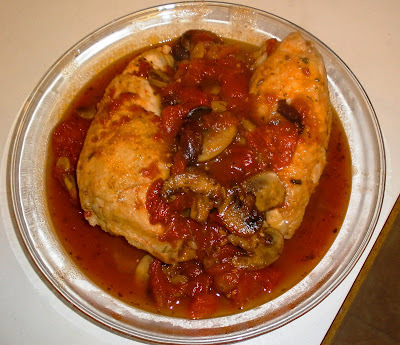 Put chicken pieces in a baking dish that snugly holds them (very sweet). Pour lemon mixture over. Toss to coat. Cover and refrigerate for 2-12 hours. Place chicken on grill and let them brown well and turn them over. You can brush some of the marinade on them. Cook until juices run clear when pierced. Serve. Rosemary and lemon. It sings. In retrospect, I could have decorated the platter. But we were hungry. I roasted some asparagus in a 400 degree oven for about 8 minutes. First, I drizzled them with sun-dried tomato oil and put a wee bit of salt and pepper on them. 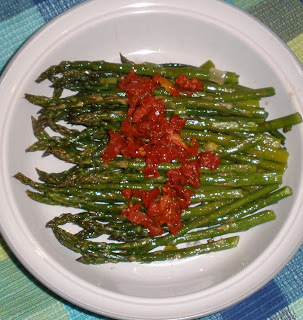 When done, I chopped up a few of those sun-dried tomatoes and threw it on the asparagus. 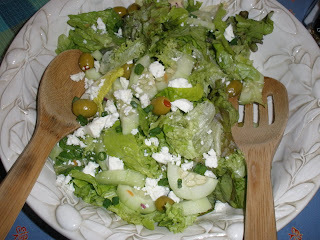 Finally, I threw together a Greek Salad. We are no longer "thinking spring." We are eating it. "By the pricking of my thumbs, something fishy this way comes"
I adore lobster - growing up in New York City and vacationing in Maine, I was introduced to this luxurious treat in my childhood. Shrimp (never frozen) makes me sing. Halibut can be a delectable. And then there's salmon. Widely available, sustainable and sometimes I like it and sometimes I don't. My favorite is the Copper River Salmon - available four weeks out of 52. Minnesota does seem to get a good crop of salmon in from Canada all winter. Fresh. Sustainable. I like the idea of that meal usually more than I like the meal itself. As our weather soared into the fifties, I took some salmon home. Grilling season has begun. My entire block was lighting up their grills. And I tried a variation of Giuliano Hazan's recipe. I can usually count on him to give it a light, Italian taste. And he came through. Preheat gas or charcoal grill (I am hooked on charcoal). Put the lemon juice and the salt in a small bowl and stir till dissolved. Chop the herbs finely to have 2 T of each. Add herbs to the bowl and whisk in 4 T of the olive oil until emulsified. Season fish with salt and pepper and coat it with the bread crumbs. Drizzle remaining 1 T of olive oil over it. Place salmon on grill. Cook the fish for about 5 minutes per inch of thickness, turning the fillets once. 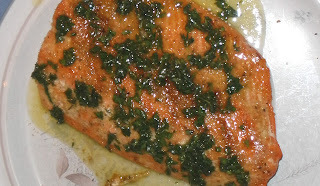 Salmon should be pink in center and flaky when done. Transfer to a serving platter, pour the herb sauce over it and serve. It wasn't fishy - tasting like the first buds of spring - all lemony and herby and fresh. I liked it. Don't think I will even do the breadcrumbs next time. There. I said it: next time! So, maybe it isn't that I don't like most fish, maybe I'm just fussy over its preparation. Oh! And for dessert? 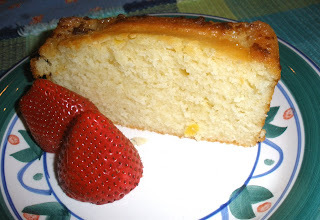 I had my eye on the French Yogurt Cake that was the recipe of the week over at Tuesdays with Dorie. It was perfect and will be the dessert for the monthly family Cover Girls Cooking dinner. The recipe is here. Late last night I realized that yesterday was the first birthday of Journey of an Italian Cook. 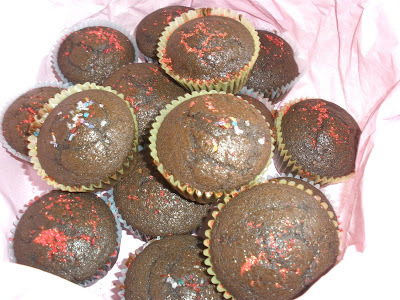 Happily, I had these delicious Italian-Chocolate-Brownie-Muffins courtesy of Italialicious. I visited my son up in Collegeville yesterday for his birthday. I couldn't figure out whether to bring the Italian-Brownie-Muffins or the French Walnut Cake. I put it to Facebook and the answer came back 2-1 for the Brownie-Muffins. Of course, my son weighed in and that really was the deciding factor. I wound up with 20 of them so fourteen went up north for the the college kids and the rest stayed down here for my daughter and to celebrate the blog's first birthday. A fitting treat. And delicious. What I really loved was the aroma. You could smell the sweet chocolate before it touched your mouth. And the aroma has no calories. 1. It is a good thing I went into playwrighting because I never would have made it as a food stylist or photographer. 2. Bloggers are some of the more generous, creative people in this world - and a special hurrah to the food bloggers. 3. My family is not as weird as my children think - many people's families have their most important memories entwined with food. I started the blog as a way to create a memoir of recipes and memories for my family. The Italian childhood I experienced in Queens, NYC is light years away from their Midwestern home in White Bear Lake, MN. I wanted them to know about my great-aunts who brought a complete saurbraten dinner (and a pitcher of Manhattans) on two subways and a bus to take to my parents on New Year's Eve. They will forever be my three Magi. I want them to know more about what is was like to be able to have three kitchens at your disposal. If dinner wasn't appetizing to my childhood palette, I could walk to Aunt Rose's or Aunt Fay's and get myself invited for dinner. I want them to someday say to their kids as my Uncle Rocky always told me, "Aren't we the luckiest people in the world? We're having pasta for Sunday dinner!" And through my blog, they can meet Uncle Rocky. And I have come full circle. As I have teased my mother and my aunts in the past about their habit of gnawing on bones, my children now have a wealth of stories about their own mother's odd habits. I sit here with seeds remembering the tomatoes from last year and the years before. And there's always a story. I remember with glee when my son was given some hot peppers and he devised a recipe, photographed the finished product and sent it to me - with notes! And then there was the week before Easter, where I cooked up some Italian Wheat Pies. It was snowing, Christmas Carols were on and it sent me back to remembrances of Easter's past. Blogs evolve. Eighteen months ago, I started a blog about my 20-odd years of working with kids in theatre. Some colleagues mentioned to me that if I didn't write my experiences down, I would never remember it. I now use it as part musings, part mentoring and a little bit of marketing. My sister and I recently started a blog (Cover Girls Cooking) as a New Year's Resolution. We would commit to cooking the cover recipe of Bon Appetit or Tastes of Italia (or both!) every month. It is a fun challenge - not knowing in advance what you are cooking. It is also a grand excuse to commit to an extended family dinner every month. And it lures my children home from college. And - you really only need to blog once a month - the night of the Cover Girl Dinner. When I started this blog, I hadn't read any others. Oh the arrogance! Now, my goals for this blog are changing. Food will always be tied to musings and memories. I will always look back with great pleasure, but with the help of this amazing cyberspace community, I will also be looking forward. Oh! 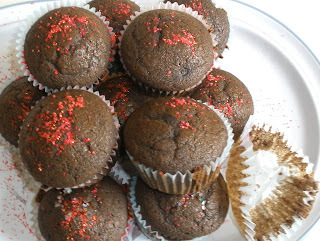 And the Italian-chocolate-brownie-muffins. You will want the recipe. As you can see, I tried it out for you. And you can find it on Daziano's blog Italialicious. March 12. Four months till my fifty-something birthday. Two months until my son's college graduation. The sudden knowledge that I will not be covered up in winter-wear forever hit me. Time to switch to spring eating. In a fit of spring fever (even while it was minus four F outside), I emptied the fridge. Toss, keep for dinner, toss, keep for dinner. And I looked at what I kept. Left over garlic, leftover onion, some grape tomatoes, some Kalamata olives. Took out the chicken breast and made my last winter-comfort food. Even if we go back down to zero, I will be grilling salmon. It will be spring inside my home if not outside. In a little bit of olive oil, I sauteed the onions (my leftovers were red ones) and garlic (slivered). When they were soft, I seared the chicken. I threw in the last of the grape tomatoes and about ten pitted Kalamata olives sliced in half. I went to my pantry and threw in some canned plum tomatoes. And then, because I could, I added about 1/2 cup of white wine. I felt virtuous - like Grandma Gresio - who never owned a cookbook. Somehow it would work. My last comfort meal until November 2009. The food would only get lighter and lighter as the daylight increased. I simmered all together for about forty minutes. And it wasn't bad. It wasn't bad at all. Added a little brown rice (fettuccine would also work). And felt soothed. My fridge was sparkling and empty. Ready for baby lettuces, asparagus and leeks. Some berries and yogurt. And am thinking maybe even losing one pound a week would go a long way into fitting into spring clothes. Spring may be arriving in a week, but in Minnesota, I have a wee bit more time. At least a month. Maybe four pounds will be gone by then. Maybe six. I'll take it. I'm tossing winter aside. Shedding my old skin. Definitely thinking spring. My Italian gene is rebelling. Grandma Gresio did not go outside in -10 degrees F. It didn't happen! Even in New York City. Oh sure, New York has a day here and there below zero. Every three-to-four years. Minnesota has about 35. Or 40. Who knows? I lost count. But when March comes, there is an expectation that the low is fifteen degrees above zero and the high is maybe even - dare I say it - 40 degrees above zero! We had a spring tease. I bought salmon and had salad. I cut up vegetables for snacks. I found credible berries and sprinkled creme fraiche on it. (I need to learn how to get the "accents" on blogspot!) And last night, the sleet storm hit. A salad and a piece of poached fish with lemon was not going to do the trick. When I was little, I adored vinegar. I would drink it straight from the bottle. (I have since graduated to wine.) My sister would eat a stick of butter. I was the healthy one - if a bit sour and vinegary. She is now the skinny one and I am - hmmm struggling to take of my comfort-food-weight. And the uncomfortable weather does not help! Last night, the dog refused to go outside. The ice pelted the windows. 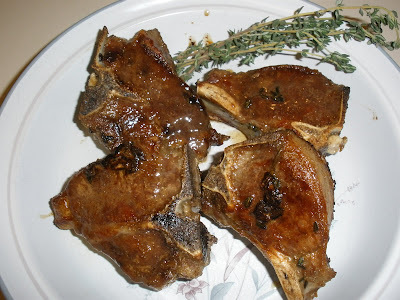 And I came across a recipe of Pork Chops with Balsamic Vinegar. It was one of those moments of serendipity. I had all the ingredients. I would not need to risk life and limb to run to the grocers. And it had vinegar! And I wouldn't need to drink it from the bottle - I could have it as a sauce. I would be civilized. Sometimes it takes so little to make me happy. 3. While the oil is heating, put flour on a plate and coat both sides of the pork chops with it. Place the chops in the pan and brown on both sides. Transfer to a plate and season with salt and pepper. 4. Add onion to the pan, season with salt (I didn't) and lower heat to medium. Saute and stir occasionally until onion softens and turns golden - 8-10 minutes. 6. Transfer chops to a platter. The sauce in the pan should be thick enough to coat the meat (it was). If it isn't, simply reduce it until it is! Then, remove from heat and stir in the balsamic vinegar. Pour the sauce over the chops and serve at once. 7. Leave tablespoonful in the pan for sipping when you clean up. 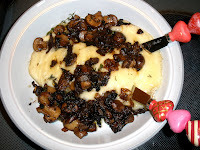 Good with rice, potatoes, polenta.... Eat and stay inside until the ice melts. In April. There are two things that put me instantly at home. I can go to any theatre and know exactly where everything is. I sense a feeling of belonging even if the theatre is new to me. Blindfolded, I could make my way to the dressing rooms, to the prop room and with my sense of smell find the scene shop. The theatre has been my second home since my days of yore. I enter a room and smell garlic. I time travel to Grandma's connected home in Queens, NY. I find myself in Aunt Rose's kitchen. In my own Sunday-kitchen childhood. I am in every small Italian restaurant of my past. I am enticing my children home with its aroma. If you want to sell me a home, skip the potpourri and roast some garlic. I instantly feel that this is a warm home with a caring cook. I am content. These days, a lot of lemons have entered my life. There are many challenges and sadness's. It is part and parcel of the journey of life. I am old enough to know the circular pattern of life and the concept of being on top of a hill and in the valley. And know that both changes. The season of spring recently took one look at Minnesota and headed south. It is currently snowing and sleeting. But hope springs eternal and spring does, too! So while winter waves it's last hurrah, and the lemons are thrown at me, I will not make lemonade. Too cold! I will wrap two heads of garlic in aluminum foil and brush them with olive oil. I will place it in a 350-400 degree F oven for forty minutes. I will be transported to my aunt's kitchens. And to my home off Union Turnpike. I will visit with my youth. And now, with steam rising out of it ( sorry for the blur), I will smear some on a piece of bread and get on with things. Later I will make garlic soup. Just squeeze those little garlics out of their papery homes. Put it in 4-6 cups of chicken broth. Simmer 2-3 medium peeled potatoes in the broth. When potatoes are tender, put in blender and mix well. No cream. No half-and-half. Potatoes and garlic pureed. A fitting end to a tart and icy day. I have the worry gene - definitely from the Italian side of the family. So, when my son told me way back in September 2008 that he and his buddies were planning to drive to San Diego from central Minnesota during Spring break - I instantly started to worry. Spring break is - now. Early March. One of the snowiest months of the year. And if I didn't have snow to worry about, there's always ice. And the fact that the Crown Vic does not do well on icy roads. And then there's the Rockies. Don't get me started on the Rockies! And the fact that four twenty-one year college seniors planned on travelling the three thousand miles in one fell swoop - through the night. No matter that they left Minnesota after their last final at 4 p.m. during a snowstorm. Not a lot of sleeping went on in this house that night. But they made it to San Diego and they only had one slight altercation with an Oklahoma toll booth (the "boys" did not bring enough quarters, were followed by a trooper, all is happily resolved). They started home yesterday morning. We received text messages on our cell phones each time they passed into a new state. We were keeping an eye on the weather as were they. So, Paul and I spent the day with our taxes. I write plays. I teach and direct theatre. I average about 10 1099's. Enough said. And then of course, this is the weekend we lose an hour's sleep. I could be practical and say, if I was going to lose sleep over my son's road trip anyway - it might as well coincide with "the weekend of lost sleep." And then the phone rang. At 5:30 a.m. Or 4:30 a.m. or 6:30 a.m. All I know - it was dark. And early. My heart stopped, my husband flew out of bed and when I heard him say, "Hi, Matthew," I felt a wee bit relieved. It wasn't a state trooper. It was my son. They were driving about 20 mph through dense fog (see, I was so fixated on the snow, ice, Rockies, lack of sleep, I completely forgot to worry about the fog!). They hit a patch of ice and went into a guard rail. All were fine. One head light out. And they would remain on the side of the road in Nebraska for four hours. The state troopers had a busy night. There was no going back to sleep. And my mind was racing. He was still in Nebraska with a ways to go before arriving safely back in Collegeville. I needed to occupy myself. I thought about bread - because you could bang it around a lot and get out pent-up nervous energy. But then, you need to let it rest and I was in no mood for anything to rest. I thought about homemade pasta -but with the busy kitten, all I could see was "Pasta-with-fur-about" and it didn't sound appetizing. I wanted something mindless, easy, comforting and fast. And then I saw the banana-chocolate cake on the Orangette blog. I would get to mash the bananas (oh! did I ever mash those bananas! ), eat chocolate, smell the cinnamon as it baked and eat it right out of the oven. And that's what I did. 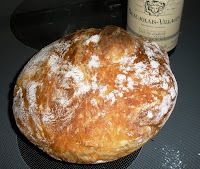 By the time the "bread" (getting real here: it's a cake) came out of the oven, Matthew and Company were in Omaha. About seven hours left to fret. Oh. And in addition to a head light out, turns out the dashboard lights also weren't working. This is March comfort at its best. With no oil or butter, but plenty of chocolate and a sugary-cinnamon topping, it's a well-worn soft throw that wraps itself around you and your home as it bakes. The recipe was forgiving of mistakes. The heart stopped pattering. I was grateful the boys were so far safe. I was wishing they were here so I could offer them a slice right out of the oven. The chocolate was oozing. Chocolate can soothe a lot of ills. This took ten minutes to throw together (I spent about eight of those minutes loudly mashing!). 35 minutes in the oven and ready to serve. Preheat the oven to 375 degrees F. Spray an 8-inch square pan. In a medium mixing bowl, mash the bananas well with a potato masher. Add the eggs, and stir well to combine. 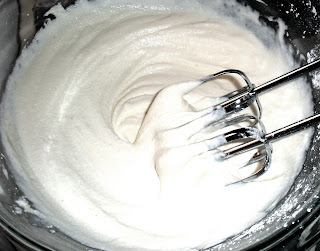 Add the flour, sugar, baking soda, cinnamon, and vanilla, and stir to mix. Add ¾ cup of the chocolate chips, and stir briefly. I will confess that I added the whole cup of chocolate chips in. Later, realizing I needed to top the batter with the other 1/4 cup of chocolate chips, I simply added more chips. This certainly offset the 1/4 cup of sugar I deleted. Pour the batter into the prepared pan. In a small bowl, stir together the topping ingredients. Sprinkle the mixture evenly over the batter and top with the remaining ¼ cup chocolate chips. Bake for 35-40 minutes, or until a toothpick inserted into the center comes out clean. Let cool in the pan on a wire rack for at least 15 minutes before serving. From the last phone call (five minutes ago), I learned that the boys are in Minnesota. Another three-four hours and they should be "home." I shall make granola until then. And wait for the last phone call saying they are back at school. Oh! And in addition to a front headlight being broken and no dash lights, it was mentioned in passing that a rear brake light was also out. All four are safe at school. And it's not dark yet (whew). And there's no snow, no ice and no fog. What there is: 12 cups of homemade granola and chocolate banana-bread-cake that served its purpose and will soon be doled out to Kirsten as she goes back to her college tomorrow. I wore shoes yesterday. Outside. It may not seem like a big deal to some of you, but I haven't worn shoes outside since early December. Just before the snows came. And the boots came out. Oh sure, on days that the streets were semi-clear, I would be out in my trusty, huge clogs - they can go through ice, snowbanks and slush and keep my feet dry. But shoes? They've been sitting in my closet itching for a walk. c. spring comes - in the way of actual crocuses - doomed to be eaten by bunnies before I head out the door in the early a.m.
And then - there was the asparagus. Bargain-priced, skinny with purple tops - gently ringing out the news that spring is - somewhere. Farewell turnips! Arrivederci celery root! Au revoir parsnip and cabbage! The asparagus is nudging in on your territory. And in my trusty shoes with a robin singing, I brought home the asparagus and remembered a simple recipe from Tastes of Italia that I wanted to try. They have you boil the asparagus and I know better - but did it anyway. My preferred method is to brush it with olive oil, throw a little sea salt on it and roast it for 20-30 minutes at 350-400 degrees F. I can then eat it like candy. But I dutifully started to follow the recipe and came to my next hurdle. Mix 4 chopped hard-boiled eggs with 1 cup olive oil. Hmmm. That's a lot of olive oil. I mixed the 4 hard-boiled eggs with about 1/8 of a cup. Salted it and peppered it. Added a touch of Dijon mustard and called it a day. Not fancy. Simple. Like a robin singing. Or wearing shoes. 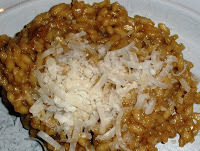 Coincidentally, over at Sara's Kitchen, she was featuring a similar recipe (her March 4, 2009 blog). She has a few more added spring-like ingredients and her garnishes are lovely and I have a feeling her recipe will be at my dinner table next week. But I first did want to share with you - that even in Minnesota there's been a sneak-peak at spring. Shoes and robins and asparagus. Can thunderstorms and tornado warnings be far behind? ... I feel genetically obligated to make pasta. I made this a few weeks ago and noted it in my Cover Girls blog - which is something my sister and I dreamed up - to keep us from going insane in the Minnesota winter (we cook cover recipes from magazines once a month). The day I made this dish, the inside of my freezer was twenty degrees warmer than the air outside my home! I was determined to find a dinner meal that did not entail a trip to the grocery store. I had wearied of putting on all the clothes in my closet to go outside. 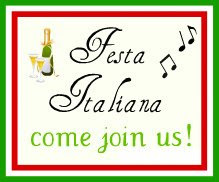 I feel like I am double-dipping - using this recipe in two different blogs - but over at La Dolce Vita and Proud Italian Cook, they are holding a Festa and I have the perfect entree: Fettucine with Ragu. Ragu was not something my family made. They worked their magic with red sauces or "gravy" as it was sometimes called. Grandma and Grandpa hailed from Potenza and Ragu hails from Bologna. Different regions, different dialects and different foods. I found this in February 2009's issue of Tastes of Italia and it fit my criteria for the evening meal: pasta, comforting and every ingredient was already in the house. Wash the mushrooms and chop them. Soak the mushrooms in beef broth for 30 minutes. In a large skillet heat the butter on medium heat. Add the onion and cook for 3-4 minutes. Add the sausage and cook for 5-6 minutes (until it is crumbly and brown). Add tomatoes and cook till mixed..
Add wine, tomato paste, beef broth with porcinis and stir to mix well. Bring to boil, reduce heat and cook for 45 minutes - stirring occasionally. The simmering time is a must. The flavors intensify and the aroma works its magic. I probably stirred more often than necessary because I liked visiting my sauce. It made me forget that the outside was a bleak frozen tundra. Stir in the nutmeg and milk and cook for ten minutes. Taste for salt and pepper. Remove and mix with pasta. Top with grated Parmesan. Easy enough for a casual meal, flavorful enough for the Festa and a quick side trip to Bologna to offset the "frozen tundra blues." Grandma may never have made it but she would have approved.